The first few seconds of this trailer for Mountains of Madness might be enough to convince you that Eldritch's upcoming free DLC will be a happy, Christmas-themed adventure. 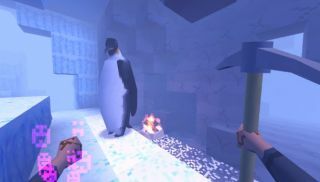 After all, penguins are too ridiculous to be scary, even in a first-person stealth roguelike. Of course, when the ice of the winter wonderland clears, we're instead left with darkness, evil and creeping dread. An apt metaphor for a family engorged on sprout-heavy Christmas dinners? Probably not. Beyond the trailer and accompanying screenshots, details of the expansion's added content are thin. What we do know is that this Arctic horror will arrive on the 19th December.